Our Benchmarking platform is now open for Compensation & Benefits data entry for the most recent fiscal year. In order to make the results as useful as possible for you and your fellow garden professionals, we need all of our members to participate. Whether you plan to answer all, or just a portion, of the survey questions, log in to contribute your garden's voice today! Your garden's specific data is private and confidential - it is never shared with anyone. All results are shown as aggregate data and a minimum of five gardens are needed for any aggregate. "Benchmarking shows not only what we're best at, but also where there's room for improvement to help the bottom line... Without Benchmarking, it's a lot more work for a lot more people." Please use the most recently closed Fiscal Year for Data Entry for Gardens Benchmarking. We base this assuming that your fiscal year is denoted by the last month your fiscal year closes in (ex. last month of FY is December of 2017 = FY17). Note we will be opening data entry for FY2017-2018 in about 2 months. For now, we are very much encouraging data entry for Compensation and Benefits (which was just opened and is due in July, or further by special arrangement). Comp and Benefits can be based on your current comp - not necessarily tied to fiscal year. Your garden's size, location, employees, volunteers and more! Use the Data Entry Guide to help your staff compile information. Please note that due to the sensitive nature of the results, only Executive Directors and their designees currently have access to this data. Sustainability Index tools that can help your garden align with the North American Strategy for Plant Conservation and the Global Strategy for Plant Conservation. "Aggregate data tells the powerful story about public gardens... You can establish baseline potentials: what fundraising could be; what attendance should be; what staffing levels are appropriate." Specialized PDF, Excel, and PowerPoint Reports and Presentations for your garden. Three years of comprehensive information from hundreds of public gardens. See where your garden compares to the 25th and 75th percentiles. Filter your results by adjusting any of up to ten variables to match comparable gardens or create a specific peer group. 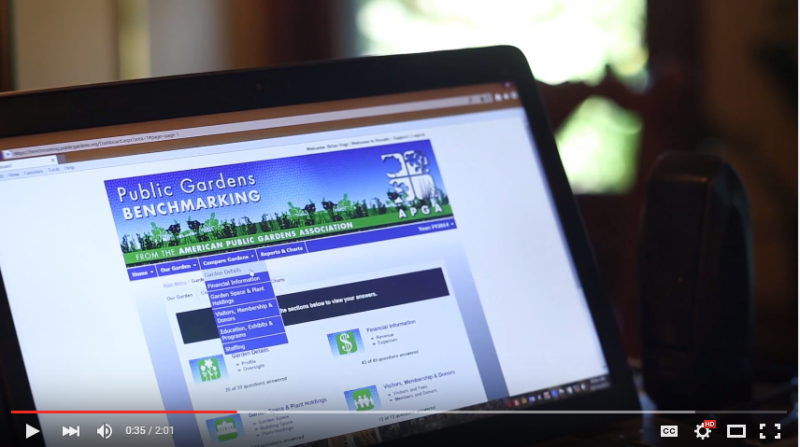 Your garden must have entered data to have access to benchmarking results. Develop informed strategies and make important decisions regarding staffing, membership/visitation, income/expense ratios, governance, financials, facilities, education, and exhibits. Easily share this pertinent information with your Board or staff by exporting information in a variety of formats including PowerPoint, MS Word, PDF, and MS Excel. "Click one button and you can have your own slide deck tailored to your garden." Don't just take our word it, watch our video to hear first-hand what more of your peers are saying about this simple to use, seriously powerful tool. Log in below to download the Data Entry Guide and the Comparing and Reporting Guide to get started with data entry, comparisons, filtering and reporting. Visit the Support page for additional information and resources. Comparisons and Reports for Garden Benchmarking is open for ALL users for FY2014-15, FY2015-16 and FY2016-17. Log in for exclusive access to direct reports that show how your gardens stacks up against your peers (your garden must have entered data to see results), provide guidance for making important business decisions, and assist you in meeting your overall goals. Comparison and reports results are now available for the newly expanded Compensation and Benefits survey. Please note that due to the sensitive nature of the results, only Executive Directors currently have access to this data. If you have further questions about access, or believe you should see the "Compensation and Benefits" icon but don't, contact us at info@publicgardens.org. View our 2015 results snapshot here.